The Friends of Music have awarded $500 scholarships to three graduating seniors at Berkeley County high schools. 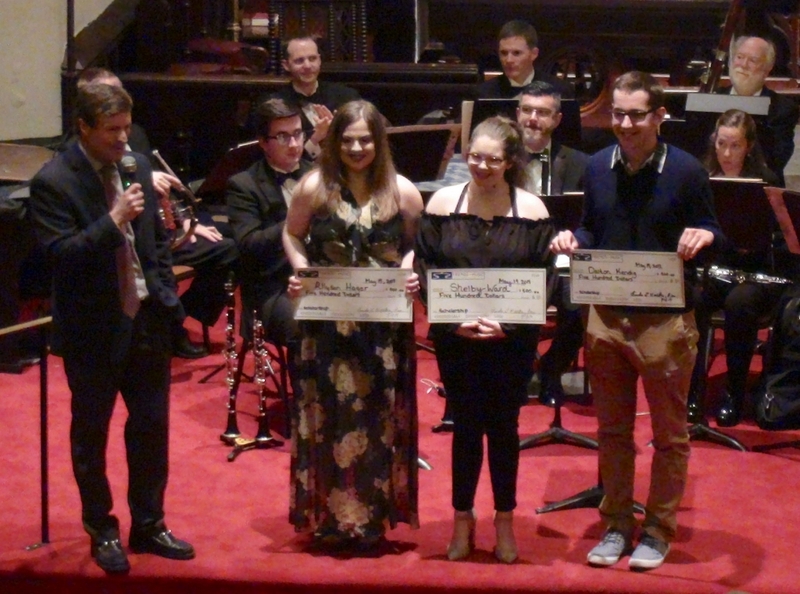 The scholarships were presented during the intermission of a Friends concert last Saturday, May 19, at Trinity Episcopal Church in Shepherdstown. The recipients were Allyson Hager and Shelby Ward, of Martinsburg High, and Dalton Kendig, of Hedgesville High. The accompanying photo shows, from left to right, Friends board member Andrew McMillian and then Hager, Ward and Kendig. All three of the students were recommended highly by the faculty at their schools. Hager has been one of Martinsburg High’s leading Voice students, serving on the school’s top auditioned choirs. She has also been active as a student teacher and has helped promote the school’s music program as a member of the Tri-M Music Honor Society. She will attend West Liberty University in the fall, majoring in Music Education with an emphasis on Voice. Ward has also been a leading Voice student and a member of the Tri-M Society. She has been a section leader, the president of the show choir and a teaching assistant. She will be attending West Virginia University, majoring in Vocal Performance. Kendig will also be attending WVU, majoring in Music Education. He plays the violin with the Berkeley County High School Symphony Orchestra and is concertmaster of the Hedgesville High orchestra. He also sings bass in the school’s Chamber Choir and is a member of the Shepherd University Community Orchestra. During his Senior year, he was chosen to be a member of the West Virginia State High School Orchestra. McMillan said the scholarships are part of an ongoing effort by the Friends group to help support music education in local schools. The Friends of Music is a Shepherdstown-based, non-profit organization that was founded in 1999 to support and promote musical excellence. It supports the Two Rivers Chamber Orchestra, the only professional classical music orchestra in the Eastern Panhandle of West Virginia, and one of only three of such orchestras in the state. Full information about the Friends and the Orchestra is available at http://www.friendswv.org.